Vitamin B complex is a series of eight water-soluble vitamins that your body does not store. These vitamins exit your body through your urine on a daily basis, after your system uses what it needs. Vitamin B-12 is the only exception, because you can store it for several years. 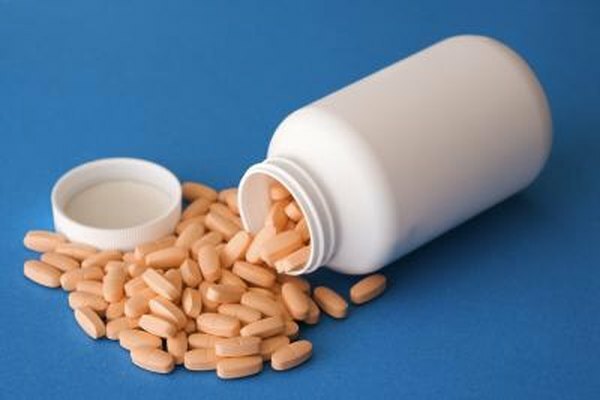 While B vitamins are generally safe, let your doctor know if you decide to take a supplement, as a precautionary measure. Thiamine was the first of the B vitamins to be discovered, giving it the alternate name, B-1. Riboflavin is known as B-2, while niacin may be referred to as B-3 and pantothenic acid is commonly called B-5. Vitamin B-6 is a series of collective vitamin compounds, including pyridoxine, pyridoxal and pyridoxamine. Folic acid, or B-9, is the same as folate, but folic acid is synthetic, whereas folate is the natural form of the vitamin found in foods. Vitamin B-12 is unique in that it combines with the mineral cobalt in order to function. In its combined state, B-12 may be listed as a cobalamin in your vitamin B complex supplement. Vitamin B complex is known for its function as acting as coenzymes during digestion. These vitamins work hand-in-hand to pull energy from carbohydrates, protein and fat from the foods you consume. You also need vitamin B complex in order to form new red blood cells, support nervous system functions and keep your skin and eyes healthy. Folic acid is especially important for women of childbearing age, because it helps prevent neural tube defects, explains the Office of Dietary Supplements. Getting adequate folic acid in your diet each day is essential, because these defects occur during the first few weeks of pregnancy -- often before you are aware of a growing fetus. Your body doesn't have a mechanism for storing water-soluble vitamins, like vitamin B complex, for an extended period of time. Your hydration status also has an influence on how long vitamin B complex sits in your system. For example, drinking lots of water throughout the day and urinating frequently flushes out the B vitamins quickly. Because your body excretes any excess of B vitamins throughout the day, getting too much is unlikely. Vitamin B complex is generally safe at large doses, meaning it is unlikely to cause adverse effects. In some cases, however, an excess of one vitamin may cause a deficiency or other problems with another vitamin or mineral. For example, excessive folic acid can mask the warning signs of a B-12 deficiency, says the Office of Dietary Supplements. Even though B-12 is the one B vitamin your body stores, large doses are considered non-toxic.